On the tenth day of the TFR, for our seventh flying day, five of us launched the west face of the knob, and spent a few hours bouncing around in crazy leeside conditions and the most cross westerly surface flow I've ever seen out there. 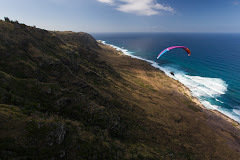 Drew and Jorge charged that rowdy air, scoring great flights all up and down the ridge, while I struggled to connect the dots for a long and challenging hour, and Thom and Allegra struggled for a shorter period. Another highly educational and rewarding mission at the farthest outpost of paradise. Please note that tomorrow, Tuesday, the area is closed to flying. We will resume our research on Wednesday! Thanks to Jorge for the timely and scenic photo! Again google dictionary open. My first west knob launch, finally got to hang it west on the knob. Which is a much better launch although the ease of launch left me scratching. If your below launch your doomed so I ended up in the dirt with Alegra.....so I couldn't complain.